Storm Insurance – Get Protected! 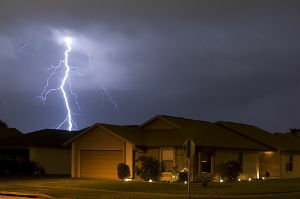 Protect your self with a storm insurance policy. Whether it is a winter blizzard, a summer hurricane or a spring thunderstorm, a sudden change of weather can put the safety of your family and the integrity of your home at risk. That is why it is important to prepare carefully and know what steps to take before the storm hits. Taking a few proactive steps now can protect your home and family later. Have an Evacuation Plan in Place. No matter where you live, a dangerous weather event could mean evacuating your home. It is important to have an evacuation plan in place if you need to flee your home to escape a wildfire, hurricane or influx of floodwaters. Keep an emergency kit near the door or in the trunk of your car. That emergency kit should include a supply of food and water for every member of the family, as well as flashlights, extra batteries and a first aid kit. You can put your evacuation plan in place right away if everyone is home, but what if you get the call to evacuate while the kids are away or your spouse is out stocking up on supplies? Part of creating an evacuation plan is making sure everyone knows where to meet. Make sure every member of your family has a working cell phone and that you know how to reach them in case of emergency. This, along with an established meeting place, will help keep everyone safe during and after the storm. Know your Florida weather at all times. When it looks like a storm is ready to hit, do not wait until the last minute to put your evacuation plan in place and move your family to higher ground. Move to a safe area long before the storm hits — traveling during the heart of the storm will be dangerous and you could get caught in a bad situation. Driving through standing water is particularly dangerous, and flooded roads could close your evacuation route and leave you stranded. If you think you might need to evacuate, do it now. It is important to prepare your property before the storm hits. Having an evacuation plan is certainly important, but there will be plenty of instances where you will ride the storm out at home. Taking a few proactive steps now can reduce the chances of storm damage later. Start by trimming any loose shrubbery and picking up any fallen tree branches that could become airborne in high winds. Dispose of that yard waste properly.Take a look around your yard and look for anything that could get damaged in a windstorm or blizzard. Even heavy pieces of patio furniture could be picked up and sent flying in hurricane strength winds. Tying those items down or putting them away in your shed can prevent damage and keep the furniture safe. Storm Insurance is one of those things you buy but hope you will never use. Even so, it is important to know where your insurance policy is and how to reach your agent if you sustain storm damage and are unable to return to your home.Keep the contact information for your insurance agent stored in your cell phone so it is available whenever you need it. Make electronic copies of your insurance documents and store them in a cloud storage service, on your cell phone or both. If you have not already done so, create an online account for your insurance company so you can access the information from anywhere.The time to prepare for emergencies is now. There may not be time to prepare when the hurricane is on its way or you are buried under two feet of snow. Taking time to prepare your home now is the best way to keep your home and family safe in the heart of the storm. *Talk to one of our agents to learn more about storm insurance and how to add it to your home insurance policy.